04 Mart 2019 Pazartesi 19:02 - 6 reads. The coming week will be an exceptional wet one. this is the sound of the forecast from Jesper Eriksen, who is on duty meteorologist at the Danish Meteorological Institute (DMI), early Monday morning. - This week comes the weather to less more of autumn than spring, he says. - Spring is wont in general to be a dry season, but now there is rain and showers in sight the whole week. In the course of the week in all fall between 30 and 50 millimetres of rain, while locally there may fall up to 60 millimeters. It is very much for a week in march, which usually falls 46 millimeters for the entire month. on Monday, starting out with bursts of and to in the whole country and temperatures between four and nine degrees. Monday will also be a windy start to the week. Special Monday evening and night, you must be aware. In the southern part of the country, there can be gusts of up to gale force, while on the coasts, can be supported hard gale with heavy gusts of wind. the DMI has issued a warning about the elevated water levels of 2 to 2.5 metres by the Wadden sea. - The windy weather seems to peak Monday around midnight, but it will continue on Tuesday, where, in the course of the day will steadily diminish, " said Jesper Eriksen. Tuesday has rain and showers in most places in the country, while the sun is in the southern parts can break forward out of the day. Wednesday starts out with some sun and scattered showers. But the afternoon comes a new rain over the country from the southwest. 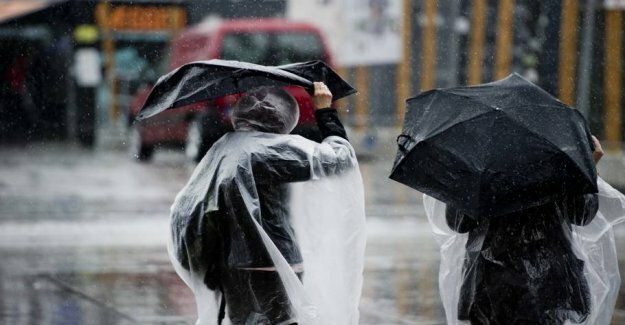 - The last days of the week will also feature rain and wind, but forecasts are still too uncertain to say, when there will be most of what, say Jesper Eriksen. Thursday looks to be the week's warmest day, with between 7 and 12 degrees. There are several nights risk a bit of frost.